Paramount Home Media Distribution’s annual parade of TV-on-DVD product selections just got another prized addition with news this week that the five-disc, 17-episode collection of C.S.I. 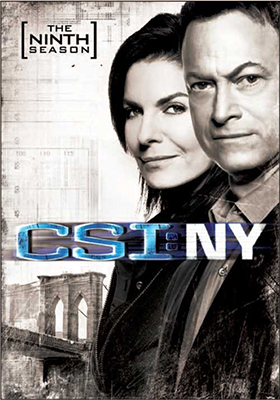 : NY - The Complete 9th Season will be heading home on June 25. Bonus features include a gag reel, deleted scenes, featurettes and a C.S.I. crossover episode. Already announced are Dexter: Season Seven (May 14), Workaholics: Season Three (June 18) and the wrap-up to the venerable Raymond Burr courtroom series, Perry Mason: Season Nine Volume One (June 11). 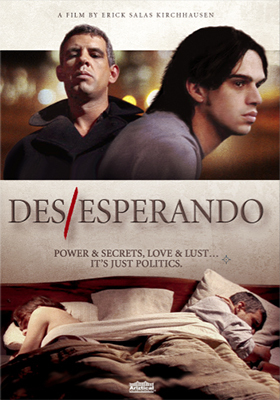 Peruvian filmmaker Erick Salas Kirchhausen makes excellent use of neighboring Chile (filmed in around Santiago) for his end-on-an-affair drama titled Des/Esperando. Ariztical Entertainment will be bringing this South American film (in Spanish with English subtitles) to the domestic market for a DVD debut on June 18. Javier (Fernando Quintana) is the dominent player — a high profile politician, complete with a wife and family — in the clandestine affair he has been having with the much younger Gonzalo (Tom Colvin) ... and it is all starting to unravel. There is too much at stake for him to leave on a bitter note, so the trip is arranged, but power, deceit and betrayal can lead to unexpected consequences in this sexually-charged romantic tale. Warner Home Video continues to deliver some really nice collectible film sets. Such is the case with the Apr. 16 DVD debut of the Nick Carter Mysteries, a trio of films produced by MGM featuring Walter Pidgeon as the famous pulp fiction private detective Nick Carter. 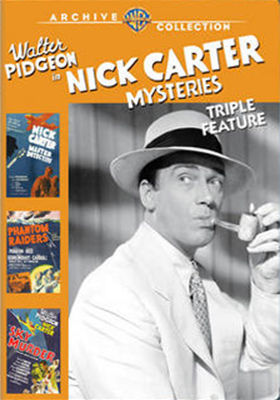 Included are Nick Carter: Master Detective (1939), Phantom Riders and Sky Murders (both 1940) … the series could have gone on for additional entries, but a little thing called War World II was on the way and Pidgeon was on the verge of resurrecting his flagging film career with the likes of Man Hunt, How Green was My Valley, Blossoms in the Dust and Mrs. Miniver. CJ Entertainment has tabbed June 11 for DVD and Blu-ray editions of filmmaker Chang-min Choo’s blockbuster film of political intrigue, Masquerade. The ARR comes in at 263 days and domestic ticket sales for this Korean-language import are just under one million dollars (over $150 million internationally). Plucked from the pages of history during the Joseon Dynasty, Chang-min Choo has spun an obscure historical entry into a delightful, well-paced tale of power and survival. 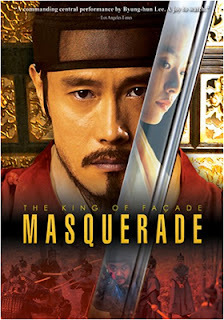 King Gwang-hae (Byung-hun Lee — I Saw the Devil, A Bittersweet Life) is fearful of assassination, so he has his chief counselor, Heo Gyun (Seung-yong Ryoo) recruit a look-alike (also played by Byung-hun Lee) to become the focal point for any attempts on his own life. When the opposite happens and the real king falls into a coma from poisoning, the inner-court has no choice but to put the peasant in charge (under a tight leash). But once he gets the hang of it — court manners, politics and how things work — he begins to make changes … all for the better! 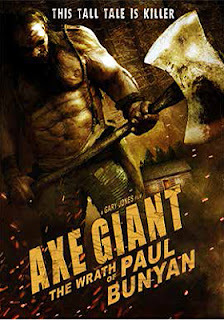 Virgil Films & Entertainment will deliver a mighty blow on June 18 when director Gary Jones’ Axe Giant: The Wrath Of Paul Bunyan cuts a blood-soaked swath to DVD. A mixed-gender “first offenders” program is a pretty clever way to gather up victims for the rampage of this legendary backwoods creature — twice the size of man who lives three times as long. Gary Jones (Boogeyman 3, Ghouls, Planet Raptor, etc.) serves up a classic slasher flick with a twist … all the elements, a bevvy of alluring beauties, a remote location, only the deranged killer is a mountain-sized mutant with a giant sized axe. Whack! Splat! Gone! We must confess that there is a certain logic to Rocket’s (Tray Chaney) plan to steal from criminals — “there’s nothin’ that they can do about it” — that’s his reasoning. His get-rich scheme is the driving force in director David “Cowboy” Keary’s Masterminds, due out on DVD from Green Apple Entertainment May 28. There’s just one little (very deadly) flaw in the plan. While the boys getting ripped off may not go to the authorities to report Rocket’s crimes, they do have a tendency to take matters into their own hands. Tila “Tequila” Nguyen co-stars as his go-to seductress, but when things go south she’s the last one that Rocket should ever cross (a woman’s fury)! Well Go USA announced two new genre releases (both on DVD and Blu-ray) for delivery during the month of June this past week. Both product offerings will be getting plenty of buzz … if for very different reasons. Up first is director Tsutomu Hanabusa’s film adaptation of Kôji Suzuki’s graphic novel, Sadako 3D. DVD and Blu-ray 3D/2D editions will be available for fans of Suzuki’s Ring horror series to enjoy on June 4. Hanabusa takes up where filmmaker Hideo Nakata took us with Ring and Ring 2 and the hideous Sadako, only this time there seems to be multiple, if imperfect, versions of the entity that claims her victims from among those who watch a mysterious videocassette. As always, Sadako 3D is a total creep-out, even if the reasoning and plot elements are a little hard to follow. It absolutely doesn’t matter as Sadako 3D will certainly please fans of the series. Two weeks later, on June 18, South Korean filmmaker Han Sang-Ho’s spectacular dinosaur saga (a CGI feast for the eyes), Dino King (aka: Tarbosaurus) will be heading to both DVD and Blu-ray (3D/2D viewing options). Set 80-million years ago, we are introduced to Speckles, a baby Tarbosaurus (these dinosaurs are sort of a junior version of a T-Rex — carnivores and deadly just the same) and his family in their own little paradise. 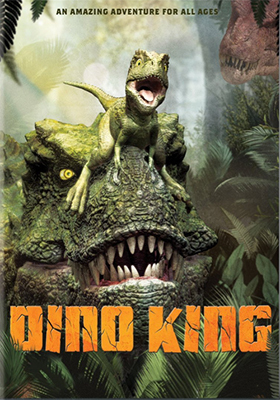 This all comes to an end when “One-Eye,” a Tyrannosaur, wipes out Speckles entire family … leaving the poor little guy to fend for himself. Eventually the little fellow grows up, finds a mate (a blue-eyed beauty) and has a family of his own. But wouldn’t you just know it, things are looking pretty good, plenty to feast on too, but then along comes “One-Eye” and suddenly Speckles finds himself in a battle to the death! Labels: Dino Kino on DVD and Blu-ray June 18, Sadako 3D on Blu-ray and DVD June 4, Well Go U.S.A.
FilmWorks Entertainment has scored a sweet romantic comedy for release on DVD this coming June 18. The film in question is writer/director Gustavo Guardado’s Love, Concord, and it is one of those “below the radar” indies that surfaces from time to time that absolutely amazes and captures its audience’s heart with a mixture of charm and well-crafted storytelling. Where does one begin to describe what a delight Love, Concord is to watch, enjoy and ultimately savour. On the surface it reads like a teen/high school meet-cute comedy, where unlikely opposites meet, date and fall in love. It works at that level, but there is so much more going on here! First, let’s start with how Guardado deftly delivers a Latino-flavored tale, but doesn’t dwell on the fact that his two young protagonists are of Hispanic descent. They are just young people with a heritage, you are not beaten over the head with it. Turn out the lights and focus on their words; listen as their hearts speak … these are just people; people you’d like to know. The next thing that Guardado does is to cleverly tell one story, while actually delivering a far deeper message that slowly moves to the front without ever nudging the comedy elements out of the way. Love, Concord is a teen comedy that magically morphs into a romantic-themed tale of the human spirit. At the center of it is Gerry (Jorge Diaz), a high school senior who is everyone’s good buddy. He’s grown up with them as the class clown. He is funny … you have to give him that. But, as the film unspools we begin to suspect that he uses this as a front to mask his own insecurities. Life hasn’t been easy, especially at home. The unlikely candidate for the Juliet to his Romeo is the more-than-serious, slightly plain, a little chubby, but not unattractive Melinda (Angelina Leon). In a lot of teen movies she would be a background character … not the romantic lead. Over the years, Gerry has gotten nothing but bad dating advice from his friends (sort of a running gag) and his choice of “girlfriends” seem to be of a certain type … attractive and shallow. Melinda is clearly the opposite of this! This seemingly oil and water couple is actually a perfect match. By film’s end you have completely bought into the relationship. It is a relationship that not only transforms Gerry — the clown act is neatly packed away — but takes the shy Melinda to another level as well; she glows. 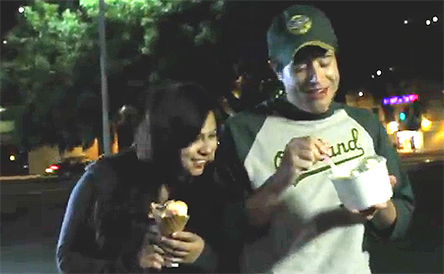 When a film works this well, we suspect that writer/director Gustavo Guardado is drawing upon his own life experiences … aren’t those always the best stories? The ones that ring true! 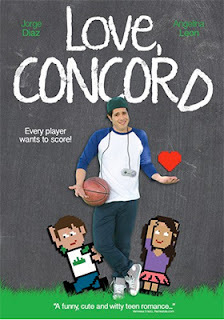 Oh, and get this, Love, Concord is his first feature-length film — it’s nice to have this beauty on your resume! Bonus features include a blooper reel, a photo gallery and a behind-the-scenes featurette.